India’s first seed investment and innovation platform to offer its robust and comprehensive services to support PM Modi’s ‘Start Up India, Stand Up India’ initiative. 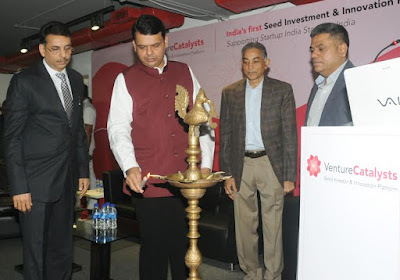 In a move that reflects the zeal towards realising Prime Minister Narendra Modi’s blueprint for the ‘Start Up India, Stand Up India’ initiative, CM Devendra Fadnavis launched the Mumbai facility of Venture Catalysts, India’s first Seed Investment and Innovation platform. This launch is aimed to provide the most comprehensive solutions to start ups through its unique, innovation-driven platform giving them access to the company’s vast angel network, venture fund, co-working facility and its invaluable post-investment support and strategic counsel. Venture Catalysts’ revolutionary approach to seed investment and its unstinted focus on revitalising the angel investment landscape in Mumbai will enable fostering entrepreneurship in India through lucrative ventures that are homegrown and sustainable. While the Start Up India, Stand Up India programme is aimed at helping budding entrepreneurs to build, finance and secure ease of operations for their ventures, through funding support from the government, it also outlines the criteria to define ‘Innovative Start ups’ and tailor a special support infrastructure for them. Designed to cater to the needs of such enterprising ventures in Mumbai, Venture Catalysts’ new support facility in Andheri offers 5,000 sq ft of a dedicated and well-equipped space for the operational needs of newly incepted ventures. From a fully functional reception area, lounge, work desks, conference rooms, board rooms, private cabins, lockers to recreational spots, the advanced facility offers all amenities that can stand a start-up in good stead without having to invest capital in them. The inauguration event commenced with an introductory note by Dr. Apoorv. The 'Lighting of the Lamp' ceremony took place at the hands of the honourable CM Fadnavis, followed by addresses by Vallabh Bhansali, Chairman and Co-founder of ENAM Securities Pvt. Ltd, and Ambareesh Murty, Co-founder - Pepperfry. Shri Fadnavis, was then called upon to deliver the keynote 'Start-up Address' which championed the cause of a self-reliant and prosperous India. An introduction of Venture Catalysts, its Co-founders and Board was followed by panel discussions on 'Building A Global Start-up' and 'Emerging Start-up Sectors in 2016'. An 'Investor Connect' session was also held wherein 20 curated start-ups got a chance to speed date with Angels and Early Stage VCs to secure funding. In order to provide comprehensive single-point start-up solutions, Venture Catalysts incorporates various verticals such as Start-ups, Mentors, Seed and Angel Investors, Venture Capital and Private Equity, Investment Banking Services, Co-working space, Accelerators/Incubators, OEMS/Vendors, Technology Enablers, Co-founders & Technologists, Business Coaching with specialised domain expertise, Start-up Events and Media, Researchers, Traction and Data Analysts, Global Access and Exposure, Tech/Business/Financial Audit and connections to enhance business. VCats will also be introducing a new breed of Angel investors called Catalysts, who will enable investments and investors. With the launch of its facility in Mumbai, VCats aims to give early-stage businesses an ideal office space to chart a bright future for themselves. Venture Catalysts is India’s first Seed Investment and Innovation Platform which adds value to start-ups through its angel network, venture fund, co-working facility and effective post-investment support. Founded by Dr. Apoorv Ranjan Sharma, former Executive Vice President at VentureNursery, Mr. Gaurav Jain, (Former Venture Capitalist at GenNext Ventures, IIT Grad and an MBA from Stanford), Mr. Anuj Golecha (Angel Investor and Partner, Banshi Jain and Associates), Mr. Anil Jain (Co-founder, Wallfort Financial Services Ltd. One of the largest institutional broking firms of India) and Venture Catalysts brings lethal combination of Capital, Mentoring and Business Network to help investee companies to succeed. With an end-goal of disrupting the Seed Investment industry, VCats will be looking to integrate services to address the various start-up requirements on a single platform. The company is looking to have about 800-1000 active angels onboard its platform in the near future.